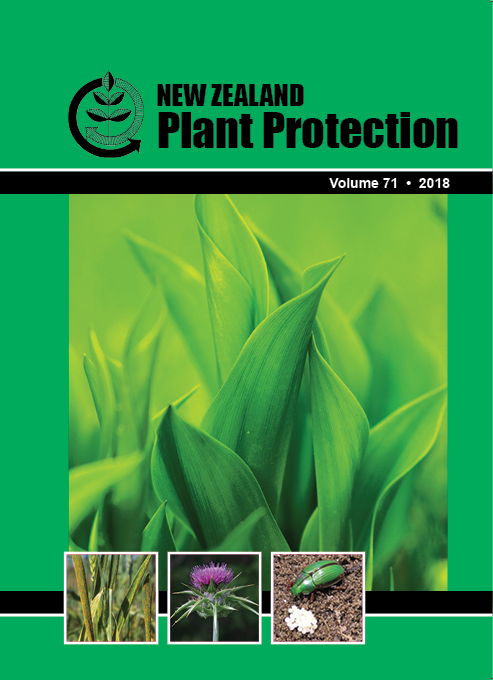 An integrated pest management (IPM) strategy was compared with farmers’ conventional pest management practices on twelve spring- and autumn-sown seed and forage brassica crops. Demonstration trials were conducted in Canterbury from spring 2015 to autumn 2017 by splitting farmers’ paddocks in half and applying the two management approaches side by side. A farmer participatory approach was used, with management decisions based on monitoring pests and biological-control agents. Farmer and adviser training with a focus on monitoring and identification was carried out. Biological-control agents capable of contributing to pest control were identified in all brassica crops. There was a 35% reduction in the number of insecticides applied under IPM compared with conventional management, negligible crop yield differences, and the type of insecticides applied was different. IPM adoption at these farms was high by the end of the 3-year project with 11 of the 12 farmers implementing IPM across 90—100% of their brassica crops. This project was a starting point for an industry-wide change of practice to IPM, which has become more widespread since its completion.